As I hinted at this morning, it’s only a matter of time before LaVall Jordan is officially announced as Michigan’s latest assistant coach. I figured now is a good time to post some thoughts on the hire before the official announcement. 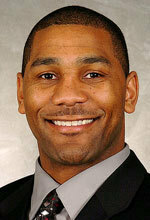 After Mike Jackson left the staff it became extremely important to move quickly in the second assistant coaching search. Team and Elite camps are just a couple weeks away and the AAU live evaluation period begins in just under a month. These are hands down the most important times of year for an assistant coach at a high major basketball program. My first impression is that Jordan is a great choice, especially considering the circumstances. Michigan needed to act swiftly and I assume the fact that Beilein already interviewed other candidates during the first search helped in this regard. Jordan is young but has a relatively strong resume. He was an assistant coach at Butler from 2004-2007 and followed Lickliter to Iowa where he coached until last season. He had accepted a job at Western Michigan after Lickliter was fired but obviously didn’t stick around for long. Jordan is known as a good recruiter with plenty of connections to the state of Michigan and in the midwest. His most notable recent recruitment was convincing Roy Marble Jr. (Southfield-Lathrup/The Family) to attend Iowa. Jordan was a starting guard for Butler and was named Most Valuable Player of the 2000-01 squad. Naturally, Jordan will be tasked with coaching the guards in the same role that Mike Jackson previously filled. I assume this was one of the main reasons that Jordan didn’t get the job the first time around, Michigan needed someone to coach bigs at that point. Michigan’s assistant coaching staff has been revamped in the last several months. They have fresh blood (Alexander 34, Jordan 31) and they also have a veteran who has been around the block (Meyer at Purdue, USF, Liberty, Winthrop, Butler, Missouri, IU). I think all of these guys have something to prove and appear to be able recruiters. Meyer reportedly played a big role in Eric Gordon’s recruitment (the clean side) so don’t throw him under the bus recruiting wise either. Only one member of last year’s staff had in-state, or even midwestern, recruiting ties. All three current assistants have either strong ties to the state of Michigan, the midwest, or both. It’s tough to complain with any of the hires and it will interesting to see how the new staff reacts when they hit the road in July. Alexander and Jordan obviously have some catching up to do in terms of how Beilein operates. His offense, his practices, and all of that. However that would be the case with most assistants and one thing you can be certain of is that they are young enough that they should be able to adapt.